For Will Hermes, a child of the 1950s who grew up in Queens, N.Y., "the 1960s was an awesome party that we had missed, and we were left to drink its backwash." New York City in the 1970s was plagued by crime and teetering near bankruptcy. Hermes, now a senior critic at Rolling Stone and a contributor to NPR, has a new book that counters the myth that New York in the mid-1970s was a "cultural dead zone." Rather, he writes, it was a time when "artists were breaking music apart and rebuilding it for a new era." 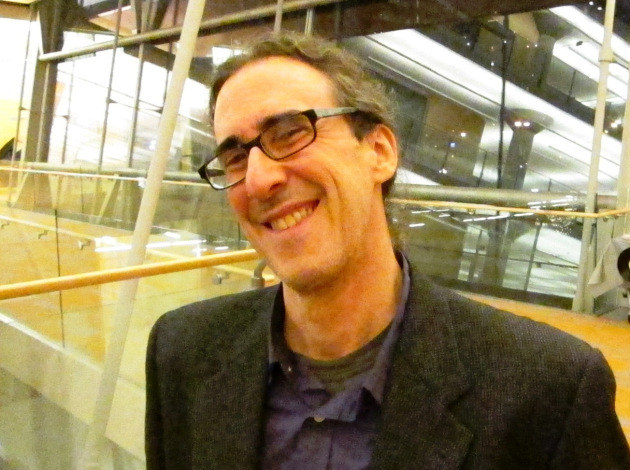 Hermes attended graduate school at the University of Minnesota and was music editor of City Pages in the Twin Cities in the 1990s. He was in Minneapolis this week to promote his new book, "Love Goes to Buildings on Fire." On thursday, he read from the book and signed copies afterward, as Jill Riley of the Current deejayed era-specific music at the Minneapolis Central Library. Emily Carter reviewed the book recently for Star Tribune. 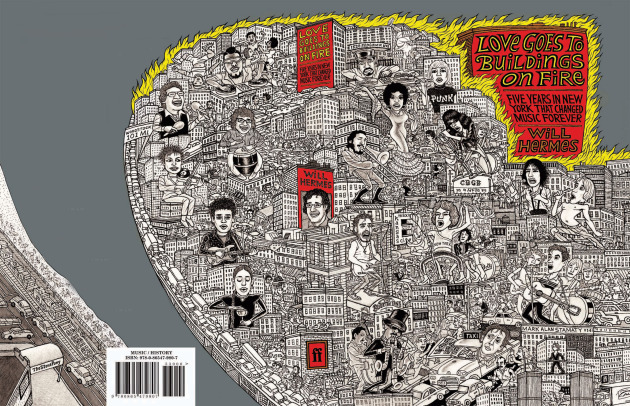 Bookjacket illustration and lettering by Mark Alan Stamaty. His book focuses on 1973-1977, and surveys cutting-edge music in genres from glam rock, punk and new classical to jazz, funk and salsa. The underrehearsed, in-your-face glam rock of the New York Dolls came early and was influential, with lots of young wannabe rockers figuring if the Dolls could make it, they could, too. Salsa was also big in the mid-1970s in New York, thanks in large part to the Fania record label. In a giant gamble, the label and several promoters rented Yankee Stadium for an all-star salsa blowout in August 1973 that turned into a near-riot when 45,000 fans rushed the field. Hermes showed a clip of salsa great Celia Cruz doing a soundcheck for a Fania-sponsored show in Zaire in 1974. 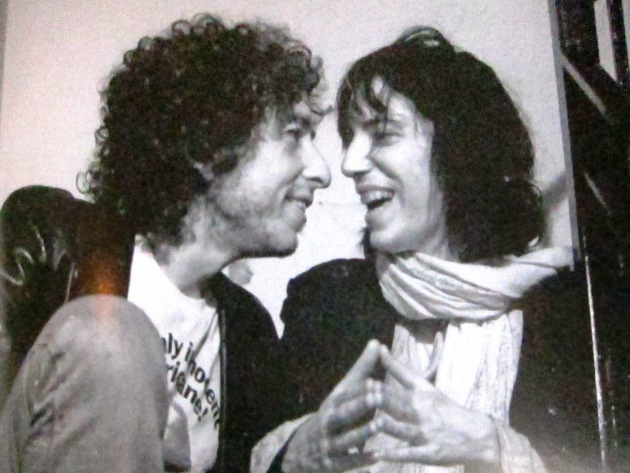 While he spent the better part of two summers combing through old clippings from the Soho Daily News and the Village Voice to research the book, Hermes said he also spent a lot of time reviewing digitzed clips on YouTube and elsewhere of seminal concerts from the era, including ones by Patti Smith, whose merging of poetry and rock had a powerful impact on other musicians and groups. Bob Dylan and Patti Smith in New York, 1975. Photo by Ken Regan, from "Love Goes to Buildings on Fire."